Sending save-the-date postcards makes wedding plans official. 3 How Do I RSVP on TheKnot.Com? Sending save-the-date postcards is an important first step in the wedding planning process, because it alerts guests to wedding day plans and courteously gives them time to make arrangements. Follow some basic etiquette rules to ensure the save-the-date cards go off without a hitch. Ideally, save-the-date postcards should be sent out about six months before the wedding day or eight months in advance if it is in a far-away locale, according to TheKnot.com. 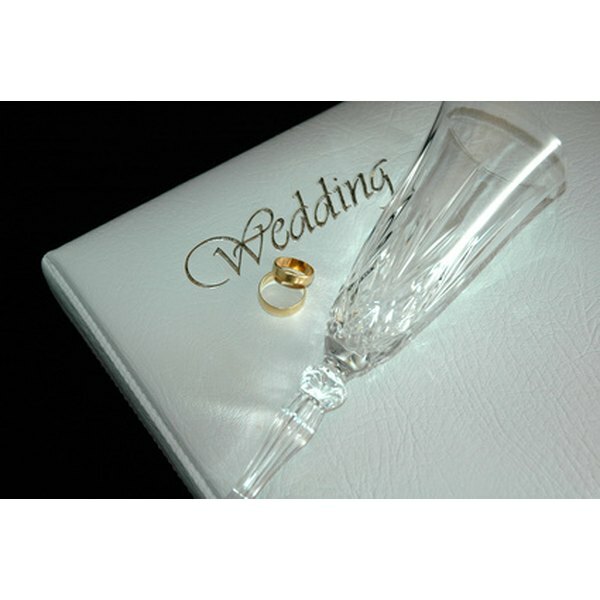 This gives guests time to make travel arrangements and prepare for the wedding. A save-the-date postcard should include the couple's names and the date, location and time of the wedding. If the plans aren't solidified, at the very least, include the date and designated city of the event. Couples should send a save-the-date card to everyone they want to invite to the wedding, even if an individual already knows the details. Every guest who is sent a save-the-date postcard must receive a wedding invitation, even those that have alerted the couple they cannot attend the event, according to etiquette expert Emily Post. Since they do not have to match wedding stationery, save-the-date postcards are a great way for couples to get creative by adding features like pictures, poetry or artwork. However, any additions should be appropriate for everyone, from the bridal party to the grandparents. The wedding budget should be finalized before the save-the-date cards are sent, because once they are dispersed, guests cannot be uninvited to cut costs. Also, be clear about who is invited to the wedding by including everyone's name on the card, advises the TheKnot.com.